As adorable as the beehive-shaped bottle is (doesn't it remind you of Winnie the Pooh? ), I was totally flabbergasted by the $18.50 price tag. What happened to the days of $12.50 Bath & Body Works?! Spiced Pumpkin Cider Shower Gel is a blend of Heirloom Pumpkins, Royal Cinnamon, Apple Cider and Roasted Tonka Bean. The shower gel's fragrance was way too rich, and overbearing, for the summer-like temperatures of the first half of October. However, once the weather started to cool (thank you, Typhoons), I did enjoy the combination of the Autumn spices, apple and pumpkin. 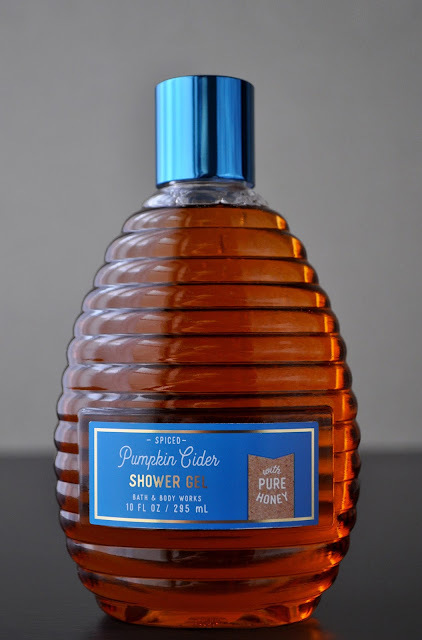 Made with pure honey, aloe, shea butter, and vitamin e, Spiced Pumpkin Cider has a velvet-like lather. I like how well the shower gel cleanses and nourishes the skin, and so far, I haven't had any Fall itches. They Can't Take Away My Dignity!